One of the things we love about Costco is the snacks. Of course we all know there are NO calories in the snacks if you eat them there. Lol. 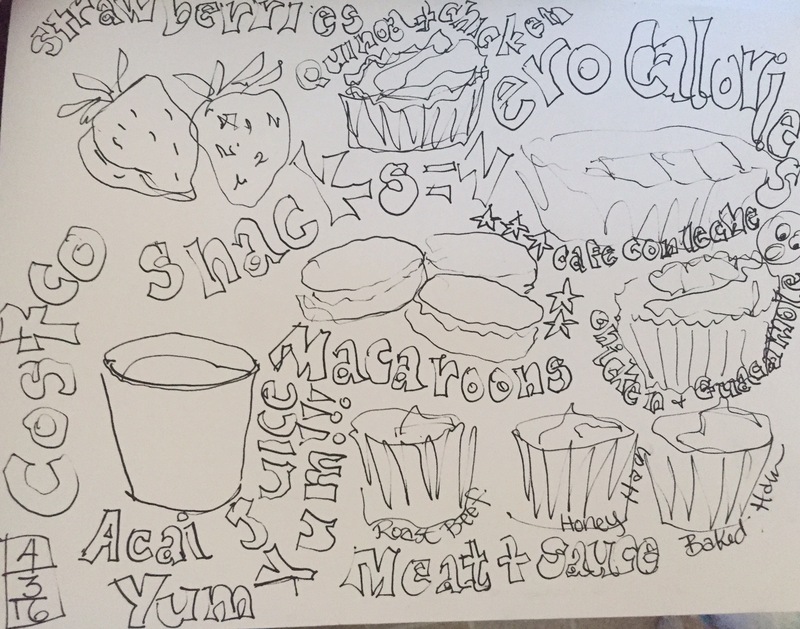 So after a walk thru of Costco with heavy snacks I decided to draw all the ones I ate. This is what I had when I left. 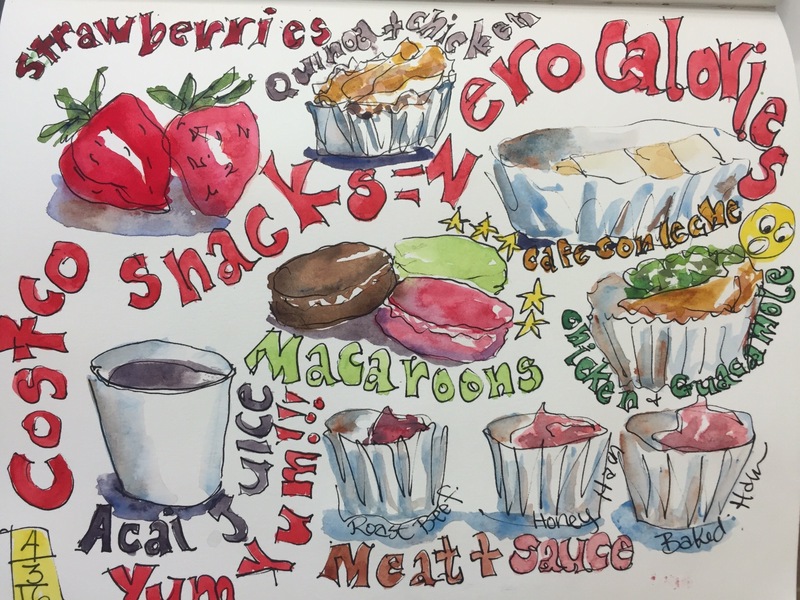 I sat at the snack bar tables and sketched it before I forgot some of this deliciousness. Drawn on Strathmore 500 Mixed Media with Carbon Black ink. Noodler Konrad pen. 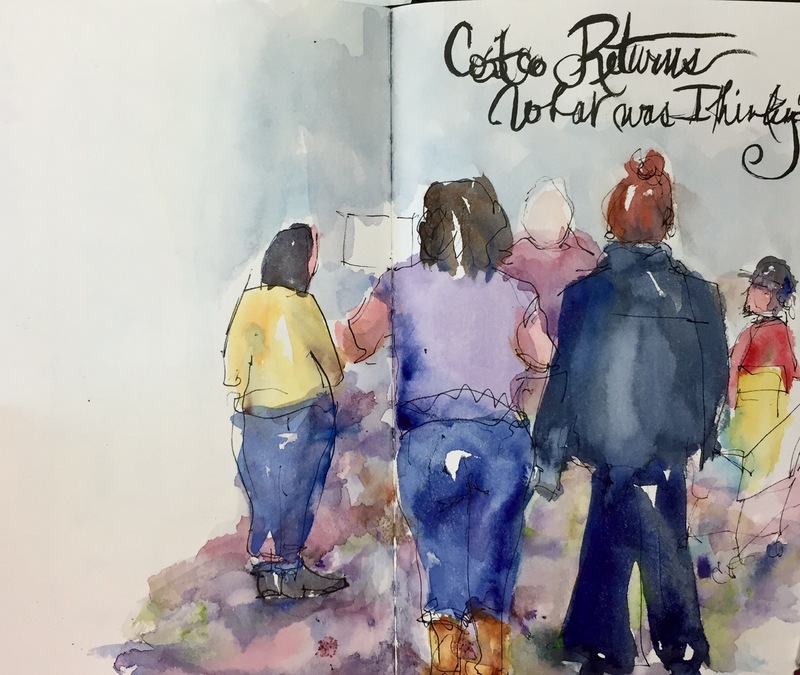 Day 628 – Costco Love! 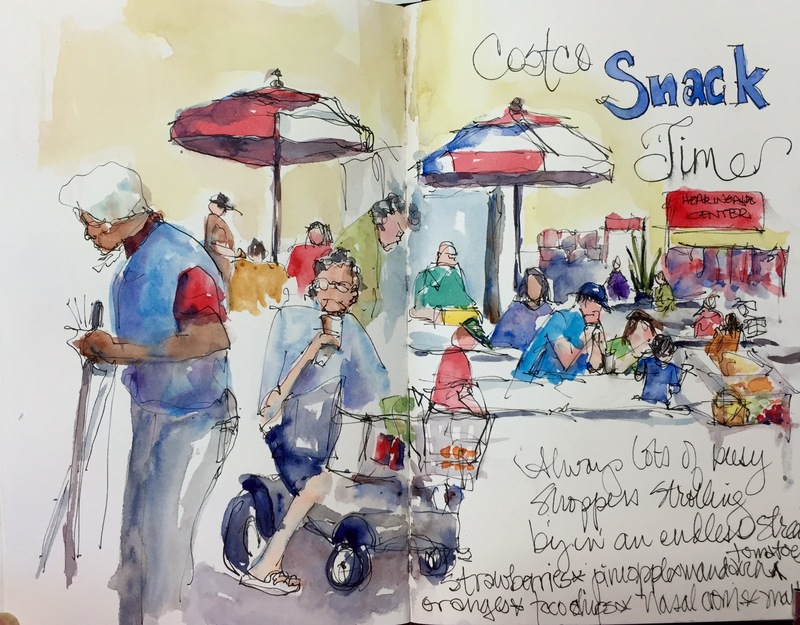 Urban sketching at Costco. And NO I did not eat a hotdog when I drew this. I usually do though. Probably good snacks this day whxib everybody knows are calorie free right?! I did hide in the corner behind my purse which is of course big enough to carry my sketchbook and pants. These people were drawn as we all stood in the return line. I love to buy stuff and bring it back to Costco. They ALWAYS take stuff bought there back no questions other than can I Have your members card please. I do LOVE Costco!! Off to class. Need to go by Costco and fill up. Gas is always 20-25 cents cheaper!! And Booking a trip to Paris and maybe Lindon and Dublin via Iceland. No time to list colors but I did use the usual ones. Thought that would get your attention. I shop too much at Costco and these are just Some of the things that I bought on two trips- one to pick up croissants and one to pick up those luscious new crop strawberries. Two friends and I were doing lunch when we started talking about we had on jeans we had bought at Costco the Amanda by Gloria Vanderbilt. And of course we had a good laugh about what else we were wearing that’s as bought at Costco like my boots. Next time we need to do lunch at Costco aka sample heaven in the afternoon. Hard to resist those impulse purchases. Yesthe Florida strawberries are in!! I may go back and paint the background yellow. I meant too but got carried away on a map for my sons weddings save the date in September. Colors. The letters started out as cobalt but were too pale so I added Inathrodone to them. Cad red on strawberries. All the green is hookers w cobalt. 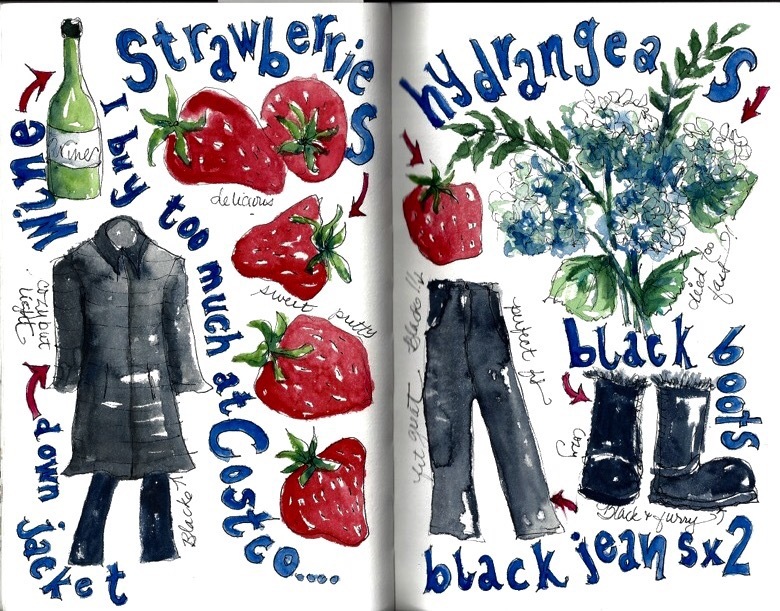 Same on the hydrangea and strawberry tops. Blacks are Inathrodone and burnt umber or burnt sienna. 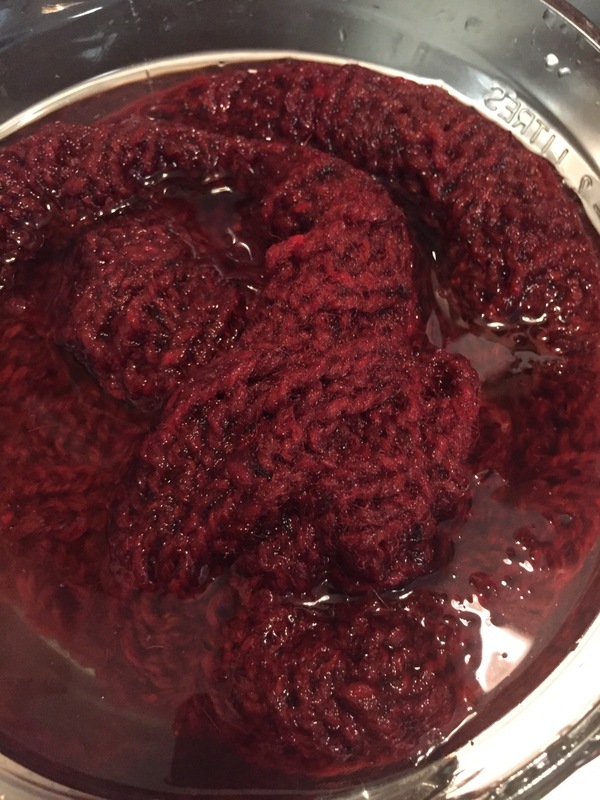 Currently dyeing a mouse brown scarf red. Right now it’s a nice rust but going to dunk it in food coloring since I already used all the koolaid. 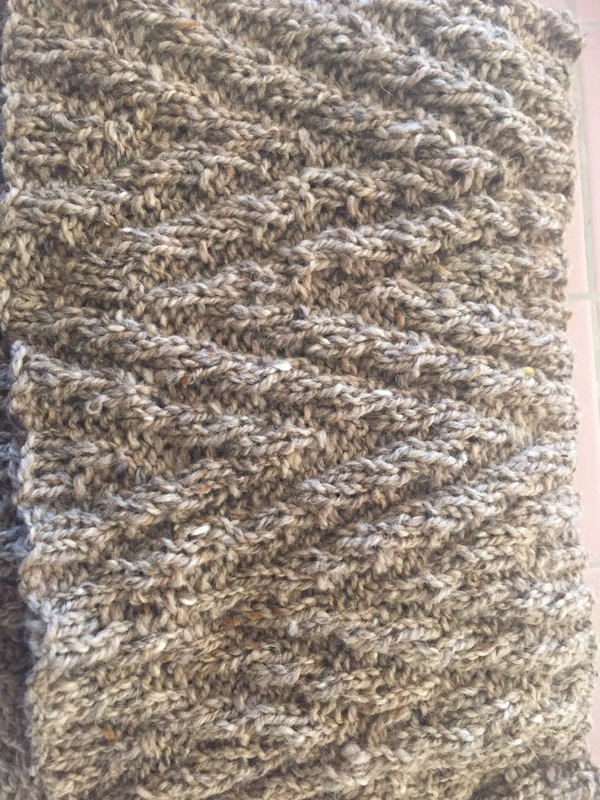 It’s soaking in vinegar and water for the next go round. If that doesn’t work back to Krogers for more tropical punch. 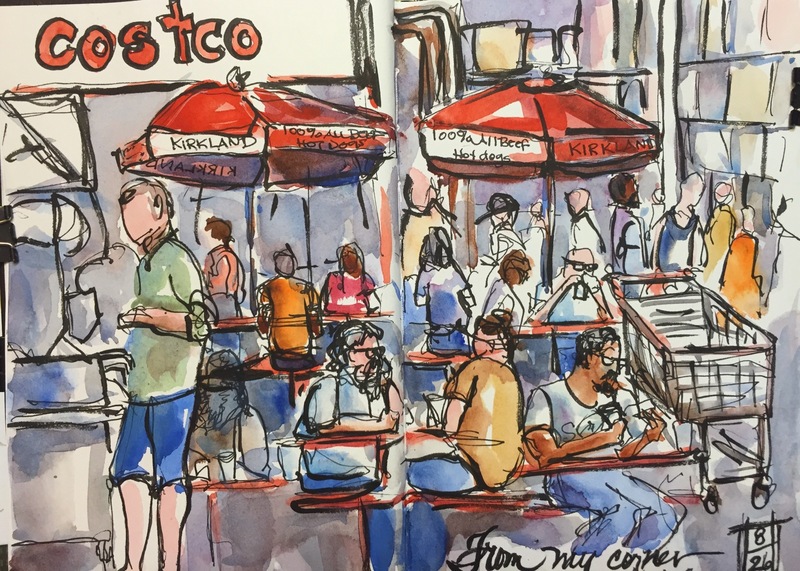 Last week I sat in the corner at Costco’ s cafe area drawing the lunch crowd. There’s one table that has a 180 view and SCORE. I hid behind my purse. I really like the way the wall of boxes turned out in the background. And the way most of the people turned out. I actually painted out one guy whose drawing went astray. Can you find him!? It was also hard getting all the bodies with legs as they came and went. Next time I will draw something easy like my polish sausage and the drink. This should be a fun place for urban sketching. Or at least getting pics of the roustabouts working. 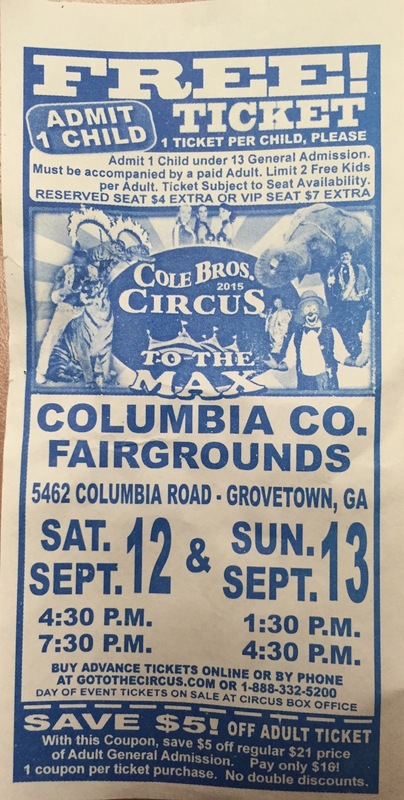 Check their webpage for when they visit near you. Thanks for reading. Class tomorrow. Busy day! !